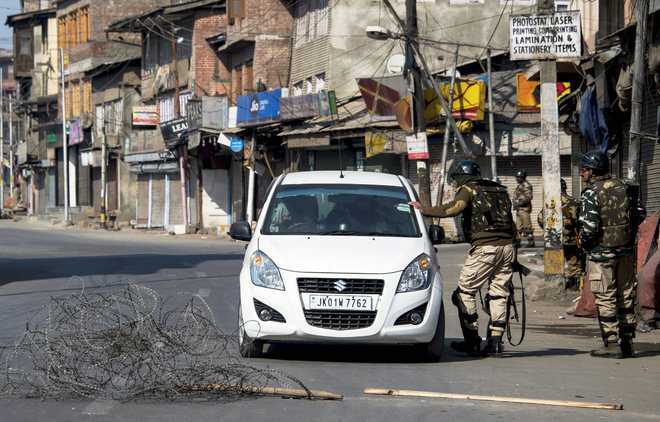 A shutdown was observed across the Kashmir valley on Sunday to protest against yesterday’s killing of two youths, who were shot by soldiers in south Kashmir’s Shopian district. Markets remained shut and public transport was suspended following an appeal for shutdown made by a conglomerate of separatist leaders. Most towns in the region wore a deserted look as traffic and pedestrian movement was absent. The day, however, passed off peacefully as the authorities imposed restrictions in the volatile neighbourhoods across the region, including in the summer capital, and deployed additional forces to prevent the eruption of protests. The telecom companies were also directed to suspend the mobile internet services across south Kashmir and slow it down in the rest of the region as the authorities feared the uploading and downloading of protest videos could fuel more demonstrations. The shutdown was called by three leading separatists – Syed Ali Geelani, Mirwaiz Umar Farooq and Yasin Malik —- who are part of a loose alliance and call themselves Joint Resistance Leadership. The three separatist leaders had called for a shutdown in response to the killing of Class XII student Suhail Javaid Lone, a resident of Narpora village of Shopian, and BA first year student Javaid Ahmad Bhat, a resident of Ganawpora village of Shopian. A third youth was critically injured. The Army had maintained that soldiers fired in self-defence after a mob of more than 250 stone-throwing people attacked an isolated section of its convoy passing through Ganawpora village. Following the incident, the police registered a case of murder against the soldiers and the state government also ordered a magisterial inquiry into the incident.